Thuraya is committed to innovation and development and has built a global distribution channel. We are in partnership and service providers of this continually expanding channel to serve a wide array of industries from all walks of life. World’s most compact satellite broadband modem. Provides high-speed streaming IP at up to 444 kbps, the fastest in the industry. Whether you are operating from land, sea or air and regardless of how remote your location is, Thuraya’s range of reliable and secure solutions allow you to operate as you would from home base. Thuraya sets industry benchmarks in design, features and functionality, and our range of reliable voice and data products provide you with the ability to stay connected in any challenging environment. Building the world’s largest subscriber base for mobile satellite handsets, Thuraya’s products are among the most competitive in the MSS market, including the world’s most durable, smallest and smartest mobile satellite handsets and broadband devices. 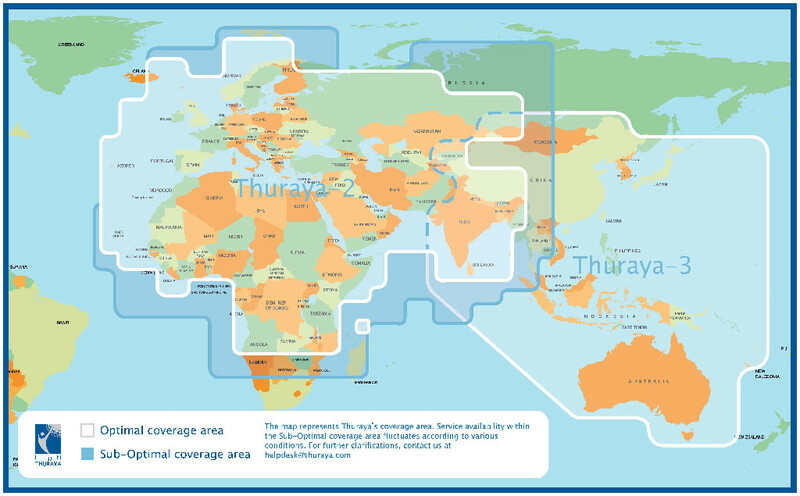 Thuraya’s coverage area takes in the majority of developing markets, by land and at sea, including huge rural communities and vertical industries. Numerous customers within oil and gas, broadcast media, military, government/ non-government organizations and maritime sectors now rely on our MSS products and solutions for durable, portable and reliable satellite connectivity. Setting new benchmarks and pushing boundaries of connectivity. Thuraya is a world-leading mobile satellite service provider of voice, data, maritime, rural telephony, fleet management and other telecommunication solutions in remote areas. Providing mobile satellite communications to over 140 countries around the world, Thuraya offers a congestion-free network that now covers most of the planet, encompassing Asia, Africa, Australia, the Middle East and Europe.